Built by George Gouldson, and originally sited in Newton Stewart. When a new cinema opened there (in Victoria St.), the Rex was moved to Wigtown. The Art Deco frontage of the Lyons teahouse pavilion from the Glasgow Empire Exhibition was added in the late 1930s. Seated ~230. Used as a bingo hall from late 60s; the facade was simplified at this point. 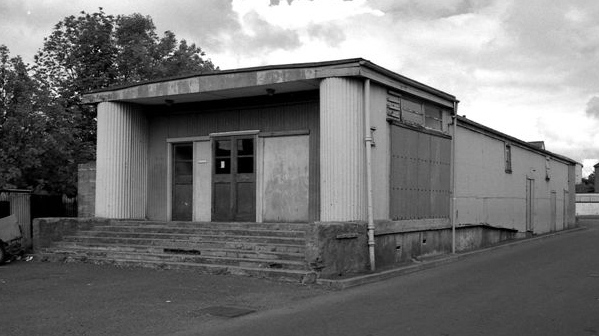 Closed during the 1980s, and demolished in 1990. A detailed view of the entrance is available here, and the rear of the building - showing its prefabricated nature - here. Photos courtesy of Paul Francis, taken June 1985.